Operated and managed by Engage Entertainment Group Inc. from Antigua and Barbuda, Black Diamond Casino Mobile offers one of the highest welcome bonuses on the market, as well as an extensive list of slots and table games. Supplied with various games from multiple providers, Black Diamond Casino Mobile is a good place for all players who prefer casinos with a wide diversity of the games. A classy looking mobile casino welcomes all adult South African players and accepts Rand, among other currencies. A variety of banking methods ensures many safe methods to make your deposits and receive cashouts. Although the online casino dates back to 2009, both, the mobile and the online version of the casino look perfectly and come with modern software platform making it easy to navigate and browse through the casino. Black Diamond Casino Mobile pays great respect to the safety of players and it has made sure to employ a couple of external auditors to check the safety of your personal details as well as all your transactions. The casino has gained three different security badges – Norton, McAfee and PCI. Black Diamond Casino Mobile offers games from several providers, so it is worth mentioning that another auditing company, Gaming Laboratories International, claims the games work properly. If you want to join the casino, make deposits and withdrawals, as well as play the games, all you need is a decent mobile device (smartphone or tablet) and the internet connection. All your operations with this casino can be done through your mobile browser and no app is required. In fact, you won’t feel a need for an application, since the casino works flawlessly when you use a browser only. Your mobile phone or tablet will come alive with more than 100 games available at Black Diamond Casino Mobile. The most popular video slots by renowned providers, such as Pragmatic Play, Rival Gaming, BetSoft, Parlay Entertainment and others, can be played in the full screen mode making your gaming experience memorable. You will have a really wide selection of various slots offering 3 reels, 5 reels or even more, with the number of paylines that go beyond 40. While the slots take the majority of the casino’s lobby, you will have your chance with other casino games as well. If you opt for blackjack, you will be able to choose Royale Blackjack, Multihand Blackjack, as well as Double Exposure Blackjack. Roulette is also available and you will have a chance to play an exclusive game – Roulette Blackjack, but also Roulette Crystal, Roulette Titanium and Swipe Roulette. Poker fans will have to satisfy with a single game – Jacks or Better, but those who prefer Scratch Cards will be pleased to hear that several Scratch & Win games can be found here. On top of that, the casino offers Keno game to those who enjoy lottery-like games. Regardless of the brand you prefer, you can access the casino as long as your smartphone or tablet works on the Android operating system. Additionally, if you are loyal to Apple handheld devices, there is nothing to worry about, since Black Diamond Casino Mobile is compatible with your gadget as well. All you need is a mobile browser and a stable internet connection and the casino will work impeccably. We have checked and this is not a joke – Black Diamond offers 200% Bonus on First Deposit. Like that is not enough, the welcome bonus stretches to your second, third, fourth and fifth deposit awarding you with 100% match bonus for each of them. All your winnings are cashable, so you can make a request once you have fulfilled the wagering requirements (25 times bonus + deposit). When trying to meet the wagering requirements you should be aware that different games count differently towards fulfilling the requirements. The contribution rate for all slot games is 100%, for video poker it is 20%, for roulette and keno 10% and for blackjack almost nothing – only 2.5%. The minimum amount you can deposit to grab this generous bonus offer is R250 and the maximum is R10,000 for each for your first five deposits. 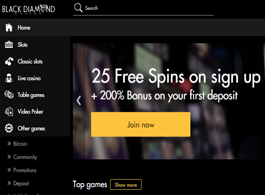 If you want to check the games before making a deposit, the casino will give you 25 free spins to warm up. You can take advantage of the casino’s VIP programme in order to get additional amenities. There are 6 different levels and you can benefit as you climb up on the VIP hierarchy and gain special promotions, higher payout limits and more. No matter which type of the various banking methods available at Black Diamond Casino Mobile you choose, you will be able to use the South African Rands. Additionally, all the casino bonuses as well as your bets will be expressed in our currency. When you decide to make a deposit, all kinds of payment solutions will be at your disposal, starting with commonly used bank cards (Visa, Master, American Express), as well as a bunch of e-wallets and others. The casino offers additional bonuses of 15% or 20% if you choose particular methods such as MoneyTransfers, Eco, Neteller, Skrill, WebMoney, PaySafeCard and Qiwi Wallet. Bear in mind that the minimum deposit at Black Diamond Casino is R250. Withdrawal methods include Bank Wire, Eco, Neteller and Skrill. The most convenient way to communicate with the casino customer support team when you are playing over your mobile phone is probably a live chat. Thankfully, Black Diamond Casino Mobile has excellent software that enables you to chat smoothly with the casino staff in real time. Additionally, the customer support is always available and you will not need to wait more than one minute to get in touch with a customer support member. On the other hand, when you register, they will try to convince you to make your first deposit ASAS, but that is understandable. However, they will politely respond to all your questions and try to solve any problem you might encounter. - No live dealer games. Black Diamond Casino Mobile gives you extremely high bonuses and a variety of games to use them on. The user-friendly mobile casino platform lets you move through the casino easily and the Live Chat tab can be accessed any time giving you a chance to communicate with the customer support members. Wherever you go, Black Diamond will be with you and, as long as you have the internet connection, you will be able to feel a genuine casino experience.